Preheat oven to 180°C. Place the chicken and lemon grass in a large bowl. Drizzle with oil and gently toss to combine. Season with salt and pepper. Heat a large frying pan over medium-high heat. Cook chicken for 2 minutes each side or until golden. Transfer to an oven tray and bake for 8 minutes or until just cooked through. Remove from heat and set aside for 5 minutes to rest. Meanwhile, combine the lime juice, fish sauce and sugar in a small bowl. Place the papaw, cucumber, mint and basil leaves in a large bowl. Drizzle with dressing and gently toss to combine. Divide evenly among serving plates. Thickly slice chicken and place on serving plates. Sprinkle with peanuts and serve immediately, with steamed rice, if desired. 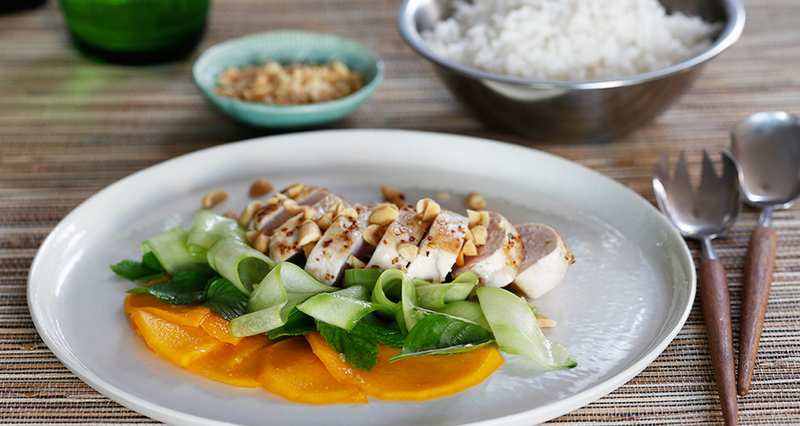 Tips: For a summery change, use salmon fillets or tuna steaks instead of the chicken. Cook salmon or tuna on a chargrill, 2-3 minutes each side for salmon; 1 minute each side for tuna. Sprinkle with 1/3 cup coarsely chopped toasted peanuts or cashews for extra crunch in the salad.